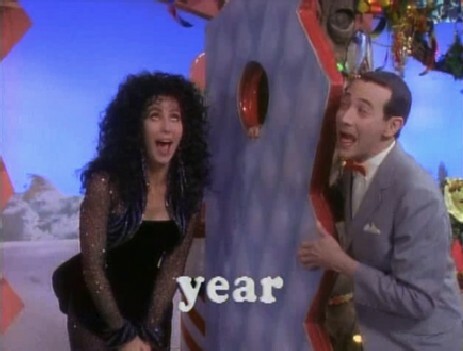 What I'm Watching: "Pee-wee's Playhouse Christmas Special"
"Cher?! What are you doing here?" I do not observe Christmas, and do my best to avoid all its attendant hoopla. And I didn't grow up watching "Pee-wee's Playhouse," a show for which I was a bit outside the target demographic when it originally aired. (The show ran for five seasons, between 1986 and 1990, when I was a teenager.) I'm generally familiar with the show and its characters, and admire Paul Reubens as a comedian, but somehow was never part of the show's large and devoted cult audience. I offer the above as a humble apology for not having seen "Pee-wee's Playhouse Christmas Special" until just a week ago. As I'm sure many readers already know, this one-hour special from 1988 is basically pure pleasure from start to finish. I feel a lesser person for having missed it all these years, and plan to do some serious catching up, Pee-wee-wise. I'm not sure I have anything revolutionary to add about Pee-wee Herman's show, comedy or Christmas special, but bear with me as I marvel at the show's very existence from a newbie's perspective. Among the things that strike me about the Christmas special is how effortlessly inclusive it is. Now more than 25 years old, and thus slightly predating the political-correctness movement, it addresses issues of cultural inclusivity in a manner that I wish more films and shows would use. 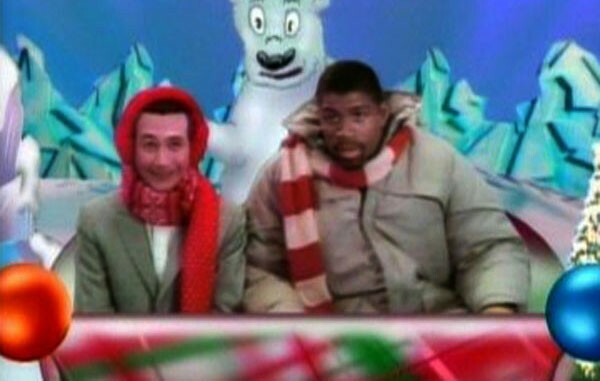 Instead of bending over backwards to, for example, include references to Hanukkah and Kwanzaa as well as Christmas — which is so typical of so many sitcoms — "Pee-wee's Playhouse Christmas Special" merely shows its characters occupying a narrative world that's populated by characters of various races and cultures. It all feels very natural, inasmuch as that term can be applied to a show about a bizarro man-child who lives in a toy-box house with a talking chair and a headless genie in a jeweled box. 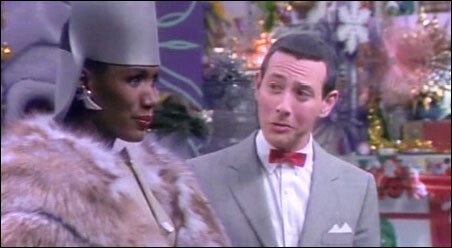 Grace Jones was probably as puzzled by Pee-wee Herman as Pee-wee was of her. "Pee-wee's Playhouse Christmas Special" stars more performers of color than Caucasian performers. The remarkable cast includes such actors as S. Epatha Merkerson, Laurence Fishburne, William H. Marshall (Blacula! The King of Cartoons is the guy who played Blacula! ), Charo, Vic Trevino, Magic Johnson, Whoopi Goldberg, Little Richard (great goshamercy!) and, my personal favorite, the incomparable Grace Jones. And a couple of the Caucasian performers — Joan Rivers, Suzanne Kent (as "Mrs. Rene") — play characters who are explicitly Jewish. Singer k.d. lang, who in 1988 had not yet come out as lesbian but was already a queer icon, also appears in the special. No explicit mention is made of her sexuality, yet queer culture is tacitly acknowledged in the special not just by the casting of lang but by the appearance of other gay icons such as Little Richard, Annette Funicello, Frankie Avalon and Cher. (The last of whom is unbilled, and is introduced with Pee-wee's immortal line, "Cher?! What are you doing here?") Not to mention the fact that Reubens' sexual orientation — a subject on which he has not publicly commented, as far as I know — was an object of curiosity even then. And let's not forget the shirtless construction workers. What Christmas special is complete without shirtless construction workers? Did I mention that these guys are building a room out of fruitcakes? The Christmasy world in which Pee-wee Herman lives is one that doesn't have to go out of its way to welcome or make special allowances for people of diverse backgrounds. They're already part of that world, no question about it. I find the show's approach to such potentially sensitive matters utterly refreshing — and unexpectedly reflective of, you know, the real world. 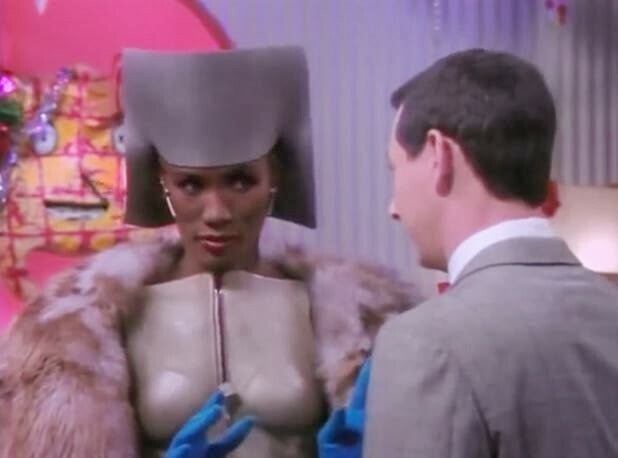 Another thing I enjoyed about "Pee-wee's Playhouse Christmas Special" is its essentially vaudeville-like structure. The special does have an overarching narrative, in which Pee-wee learns that "the true meaning of Christmas" is not acquiring a lot of gifts for oneself but being generous to loved ones. (Though it must be said that the special also includes a reference to the actual meaning of Christmas, and does so by the hilariously incongruous inclusion of what appears to be home-movie footage from a 1970s children's Christmas pageant. It's amazing.) But that overarching narrative is decidedly secondary to the special's overall structure. Magic sleigh, meet Magic Johnson. The show simply moves, often with nothing more than the smallest thematic connection, from one mildly narrative chunk to another. All that's needed to introduce a new chunk is a knock on a door or a jingle on the videophone. Or the sudden appearance of Cher. I love this narrative semi-coherence, in part because it echoes the modular structure of the vaudeville show from which Pee-wee Herman's whole shtick is ultimately borne. If you're not interested in the performing seal, just wait a few minutes for the juggler to take the stage. Oh, and there's a cartoon or two in the mix, as well. There's a little something for everyone, and the show doesn't express an obligation to be connected by some sort of unifying narrative line. The Del Rubio Triplets, who appear in the special, actually played vaudeville shows in the first half of the 20th century. This modular format — and the vaudeville style of comedy that it often undergirds — is perhaps the single most durable of all American performative traditions. You'll find it in such things as "American Idol" (and its performance-reality-show ilk), just about every Saturday-morning cartoon, high-school musical revues, Super Bowl half-time shows and all manner of other "variety" entertainment. Viewing this one-of-a-kind Christmas special within that historical context enriched the show for me. 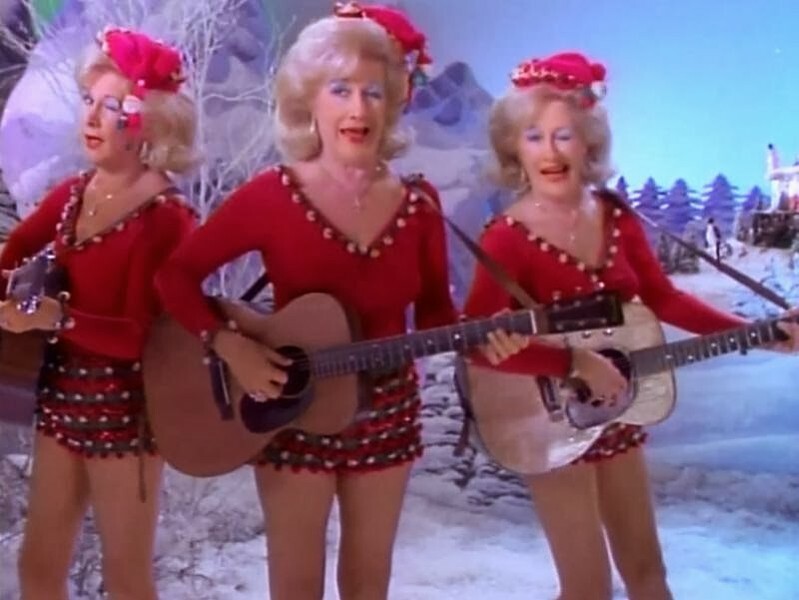 "Pee-wee's Playhouse Christmas Special" has much else to recommend it, but these were some of things I enjoyed most. And I expect it'll now be part of my holiday tradition every year. Along with Bad Santa, of course. Christmas is incomplete without a drunken, cussing Billy Bob Thornton. Grace Jones is so awesome that she gets another photo here.